Security operations in Massanutten Village (to include law enforcement) were part of the development since its beginning in 1971 as required by Rockingham County. Access to the Planned Residential Community was limited to only one entrance — that being Massanutten Drive. Property owners were required to show identification cards to «Special Police» Officers in order to enter through the gate house (shown in the photo on the right). Visitors to Massanutten Village homes and amenities were given daily passes to display in their vehicles. All residential subdivisions were clearly marked as «No Trespassing» to deter unauthorized visitors from entering. Originally, security operations were provided by the developer, the Massanutten Development Company (MDC). In 1974, the Massanutten Property Owners Association (MPOA) began administering security operations with eight (8) officers and a budget of almost $69,000. 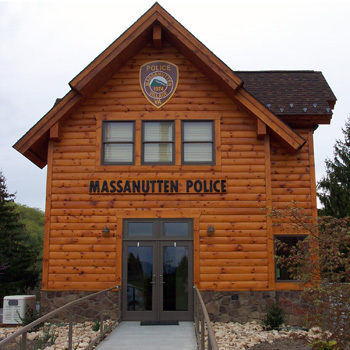 MPOA has been running Massanutten Village security operations ever since, which are often referred to as the MPOA «Massanutten Police Department» (MPD). Its officers are actually authorized to conduct law enforcement by the Rockingham County Circuit Court, now as «Special Conservators of the Peace». The MPOA security operations have been, and still are, privately funded. Today, the MPOA MPD consists of seven (7) «Special Conservators of the Peace» (or Officers) and five (5) Gate Attendants. Five (5) of the Officers allow Massanutten Village to be served 24 hours a day, 7 days a week, and 365 days a year by at least one Officer in a law enforcement capacity. The Officers patrol roughly 1500 acres with 1052 private residences and twenty-six (26) miles of roads which make up the Massanutten Village East and Kettle areas, but they do not cover the Massanutten Village West area. The five (5) Gate Attendants allow Massanutten Village service 24 hours a day, 7 days a week, and 365 days a year by at least one Gate Attendant on duty at the entrance to Massanutten Village. Their primary function is to hand out passes to all visitors to Massanutten Village, and are also responsible for keeping vehicle counts, answering phones, and giving out directions when needed. The Gate Attendants counted more than 2.44 million vehicles entering into Massanutten Village in 2010, as detailed in the last section. It should be noted that MPOA MPD staff coordinates with the private security operations of Great Eastern Resorts, which secures their timeshare units and amenities (however, they do not enforce law). 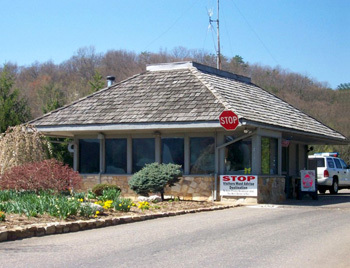 The original Massanutten Village Gate House built in the early 1970s was torn down in 2009 and replaced by a new Massanutten Police Station (shown in the photo on right). The new building has two-thousand (2000) square feet of office space readily housing all MPOA MPD operations. MPOA MPD has four (4) police vehicles equipped with radar guns, state-of-the-art radios, computers, and video «dash» cameras. MPOA MPD also has a mobile «Speed Trailer» that can be positioned on a roadside to measure vehicle speed and present that speed to oncoming traffic on a lighted board. MPOA MPD has its own state-of-the-art radio system for communications between the Police Station and Officers as well as being networked directly to the Rockingham-Harrisonburg Emergency Communication Center (9-1-1). MPOA MPD responded to 3,405 9-1-1 calls in 2009, making 370 arrests (a breakdown is shown in the table below). In 2009, MPOA MPD had a total operating budget of $589,425. It should be noted that the MPOA MPD did have K-9 operations, but the operations were retired in 2007.